The first act of the night, for a whole ten minutes, was Consumer. Do you like Sissy Spacek or John Weise? I do, a lot, and though Consumer sounded like he was trying to evoke the same brand of beautiful and chaotic noise collage, it felt totally separate from the spirit of that music. On another day I probably would have found myself transfixed by his sonic stream of consciousness vibes, but unfortunately this one just wasn’t for me. Then Liturgy went on. Hunter Hunt-Hendrix, frontman and visionary behind the band, could be seen around the building pre-show, unassuming as ever. Back together as a four-piece after losing two members following the release of Aesthethica, Liturgy are, at once, one of the most exciting and dull live acts I’ve seen in quite some time. Blasting through a spattering of songs from the new record and the ones that came before (here finally getting the full instrumentation they deserved), the band managed to recreate the walls of sound present on record in ways that were, at some moments, truly awe-inspiring. However, my biggest issue was with the stage presence of the band. I am a sucker for energetic live acts, meaning I found it hard to engage with Liturgy, who spent a large amount of their stage time standing in place. This could be seen as an intentional move, where the musicians put themselves in the background so as not to detract from the music (see: Godspeed You! Black Emperor), but whatever it was failed to draw me into their world at all. This is disappointing, considering how interesting and exciting the band are on record. In fact, even as a live act, with eyes closed, they are truly exhilarating. Regardless, I’d gladly give the band another shot later on; they may lack the right spark onstage, but they’re still incredible musicians. This time, it wasn’t them that was the issue, it was me. Next time, guys! Perhaps in a room with better sound? This brings us to Lightning Bolt. 20+ years on, Lightning Bolt are less of a band and more of a force of nature, an unstoppable hurricane of almost supernatural drum and bass brilliance. Drummer Brian Chippendale is a drummer skilled enough to come off as almost inhuman, performing less like an actual musician and more like an octopus with a Ritalin addiction. He plays with a facemask with a ballgag-like microphone built in, transforming any vocals that come from him into incomprehensible howling, which only adds to how visceral and tribal the band are. It’s nearly impossible to really pick songs out of the mess, though with Lightning Bolt, the songs are somewhat beside the point. I’ve listened to (and thoroughly enjoyed) the band’s newest record, Fantasy Empire, though I honestly couldn’t tell you how much of the set was new, and how much of it was effortlessly improvised sonic rambling. Though Chippendale draws the eye more than Gibson, if you get the chance to see the band, you should spend a few minutes watching Gibson. Though more reserved than his partner, his skills as a bassist are unbeatable, both while performing unaccompanied and while his tight grooves snake themselves through Chippendale’s powerful drum work. Separately the two are powerful musicians, but together the two make music that comes closer to being truly primal than any band since Japanese noise monsters Boredoms. I’m not ashamed to tell you that I left this one a little early. I was roped into the apoplectic frenzy of the show’s moshpit during the first song, and though that experience was truly wonderful and actually enhanced the performance for me, I will freely admit that I was terribly unprepared for just how intense the entire thing would be. This all may sound foreboding, but if you’re at all curious about this band, you should take any opportunity you have to see them. 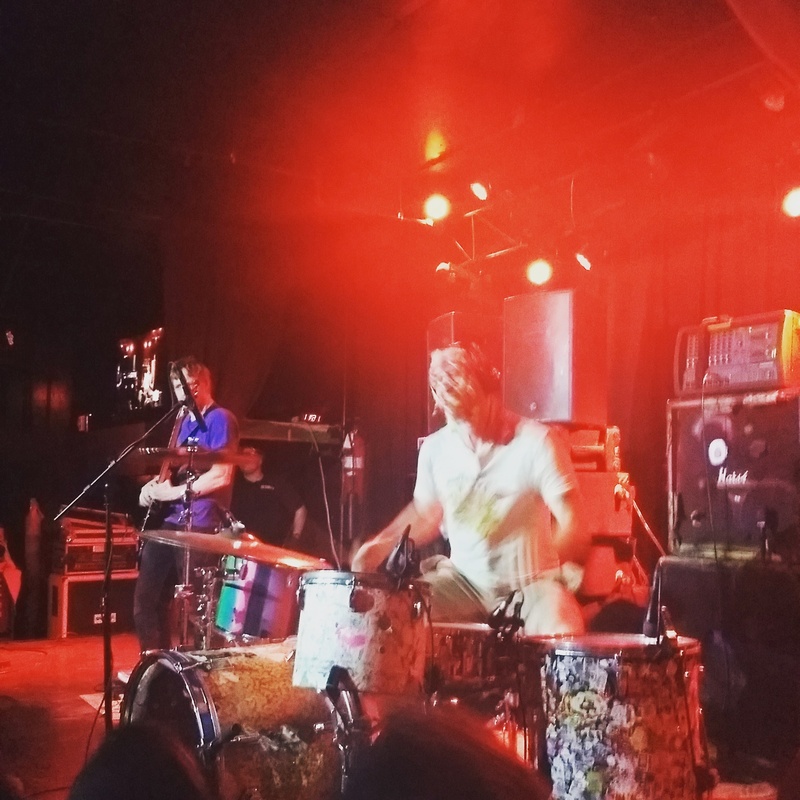 There’s no way for me to truly do justice to Lightning Bolt, as they are, more than almost any band I’ve ever seen, better experienced than discussed. Go see them before they implode.